Longleaf Breeze regulars know that Amanda and I have divided responsibilities; she focuses on vegetables and I keep up the fruit trees. For five years, as the tiny fruit trees slowly matured, I’ve watched with quiet envy as Amanda brought in baskets of produce daily from Veg Hill while I brought in a handful of berries or a couple of pears. Now, finally, the fruit trees are beginning to mature, and we are beginning to see true abundance of fruit. The blueberries did fairly well this year and seem to have recovered nicely from the fire that killed most everything above the ground. The apples were plentiful this year and set us up for 4 1/2 gallons of apple jam. 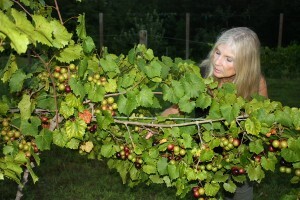 And this year’s muscadine crop is poised to be the best ever. Next year, or maybe the year after that, we hope to have enough berries to talk seriously about wine! Amanda’s checking out one of the Black Beauty muscadines in the orchard; we’re anticipating our largest harvest ever this year. Next Next post: Podcast #250 – Uh-oh. Firewood. Now!